PC races have been rebalanced to change their Daily Powers to lore friendly Constant Abilities. Heights have also been adjusted to better reflect TES Lore, and an optional Racial Body Morphs mod patch has been included to further accentuate a TES Lore immersed game play experience. Thanks to Ogerboss and Xarrian for Requiem, as well as zer0morph and Applesaucez for their inspiration. This patch follows the permission statement posted on the Requiem mod Nexus page. Breton Magic absorb is now 20% when in possession of any Daedric item. Made it so that Breton spell absorbtion shouldn't trigger during magic blessings as easily. From several users' feedback, race specific movement debuffs are removed. Fixes a base Requiem bug so that the Atronach Stone won't remove non-Magicka related Bosmer Greenpact Feast benefits anymore. 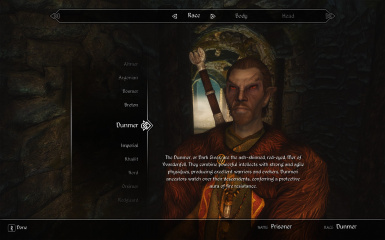 Improved Dunmer and Redguard race text. 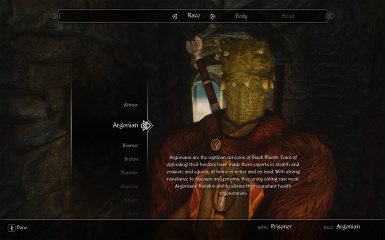 Argonians now have a scalable Health regeneration as part of their abilities. Breton now have -7.5% movement speed, with 2.5% recovered when in possession of any Daedric objects. Nord Woad maintains +50 Armor Rating and is reduced to +25% stagger resistance, both of which are doubled when drunk. Orsimer attack and defence buffs reduced to 5% at start, doubling when at less than 50% Health. Magic resist reduced to 7.5%. All previously mentioned buffs doulble when in possession of Volendrung. 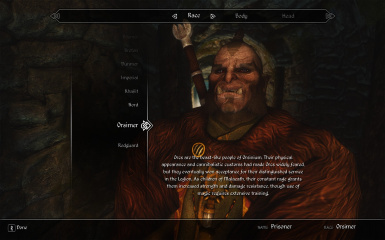 Orsimer movement speed is now reduced to -10%, with 2.5% recovered when wearing heavy armor, and another 2.5% recovered when in posession of Volendrung. Bosmer Marksmanship buff is now 7.5%. The Greenpact Feast now provides +5% attack damage and damage immunity. Khajiit now have 90% reduced falling damage (was 65%). All other race default values not mentioned are left at the default for 1.9.4.1. 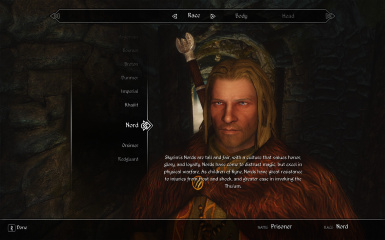 All races have their movement speed increased or reduced proportional to their height difference from a standard of 1, which also fixes a vanilla Skyrim bug. Many thanks to t0miki for bug testing. Nord Tongue's Trance fine tuned to +10% (from +15%). Nord's now have (TES Lore) Woad (Shield) ability, providing a constant +50 Armor Rating and a 50% reduced vulnerability to being staggered. Dunmer Ancestor Guardian (Sanctuary) ability changed to 10% chance to ignore incoming damage, with an additional 10% for possessing Azura's Star. Orsimar now have +25% increased chance of staggering an opponent. Altmer, Bosmer, and Orsimar now are cursed while possessing any of Kyne's artifacts. Orsimer are cursed when posessing anything related to the worship of Boethiah. Redguard scimitar increased weapon speed is now listed in the magic effects menu as the ability: Sword Singer. 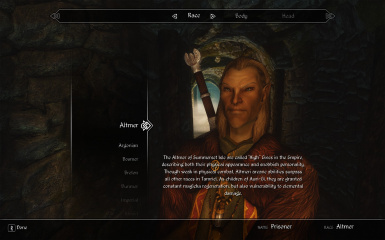 Altmer no longer get a race ability bonus for wearing Thalmor robes. This is now woven into Thalmor robes effects in IDB. TES Lore: Bretons and Orsimer move 5% slower. 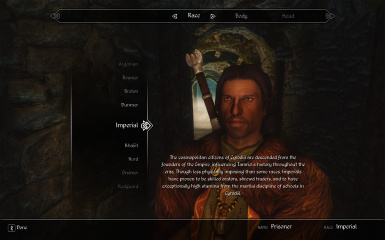 Altmer and Imperials move 2.5% slower. Bosmer Marksmanship ability effects Marksman Expertise in 3.0.X. Khajiit lockpicking buff folded into pre-existing buffs so that R-IA for 1.9.4.1 is also compatible with 2.0.X. Vampire buffs are folded back into classic Requiem records so that R-IA for 1.9.4.1 is also compatible with 3.0.X. Khajiit can jump 25% higher. Histskin daily power replaced with constant +1 Health/sec regeneration. Becomes +10 Health/sec while imbibing in Hist Sap. 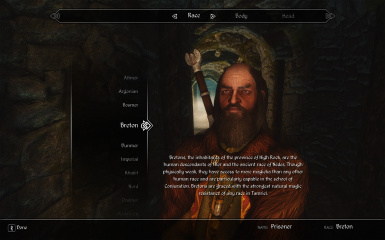 Breton abilities become 20% when in possession of Daedric items. Ancestor Guardian replaced with a constant +50 Armor Rating. Becomes +150 AR while in possession of Azura's Star. TES Lore: Fire Resist raised to 75% (up from 65% in base Requiem). Highborn daily power replaced by a constant +100% Magicka Regeneration. 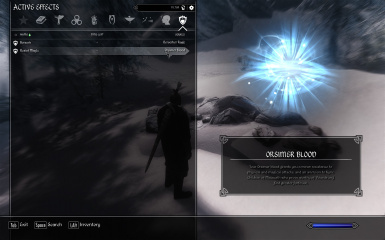 Increases while wearing Thalmor Robes, a Glass Cuirass, or possessing Daedric Items, Auri-El's Bow, or Auri-El's Shield. If using R-IDB: Imperial Cult ability: While an Imperial PC wears any of the Imperial Cult Amulets (of the Eight Divines) and maintains a given Aedric greater blessing, all followers are stronger. 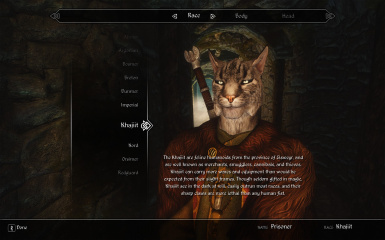 If using R-IDB: A Khajiit PC who wears the Moon Amulet (from Kharlo in the quest "Amulet of the Moon") gains the blessing of Ban Daar, granting +7.5% Movement Speed and +15% Sneak. Tongue's Trance daily power replaced with constant +15% Shout recovery. If using R-IDB: Increased blessings when wearing Kyne's Token and maintaining her greater blessings. Possessing Volendrung increases dealt attack damage, physical damage resist, and Smithing power to +15%. Adrenaline Rush daily power replaced with a constant +15% Weapon Speed and +10% dealt Melee Damage. Wielding one or more scimitars doubles this Weapon Speed benefit. Command Animal Daily power replaced by Bosmer Marksmanship, giving a constant +10% Marksman damage. Becomes +20% when in posession of Auri-El's Bow and/or Shield. Fixed a bug that was making all Bosmer bandits friendly to the PC. 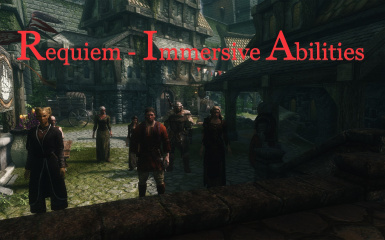 Requiem - Immersive Abilities (R-IA) rebalances PC races, changing their Daily Powers to lore friendly Constant Abilities. Heights have also been adjusted to better reflect TES Lore, and an optional Racial Body Morphs mod patch has been included to further accentuate a TES Lore immersed game play experience. Compatible with all version of Requiem from 1.9.4.1 through 3.0.x. 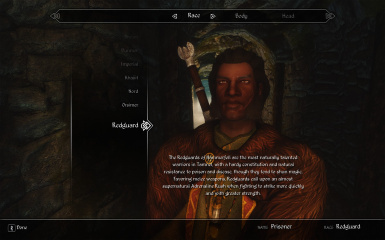 Any race records not mentioned on this mod page are set at their default values for Requiem 1.9.4.1. Histskin daily power replaced with constant +0.75/sec Restore Health and +25% Health Regeneration. Becomes +10 Restore Health/sec while imbibing in Hist Sap. The above Breton abilities become 20% when in possession of any Daedric item. Ancestor Guardian (Sanctuary): constant 10% chance to ignore incoming damage. Doubles when in possession of Azura's Star. Highborn daily power replaced by a constant +100% Magicka Regeneration. Doubles when wearing Glass armor, as well as when possessing any Daedric item, Auri-El's Bow, or Auri-El's Shield. Khajiit jump 25% higher than other races and have 90% fall damage reduction. Tongue's Trance daily power replaced with constant +10% Shout recovery. TES Lore: Woad (Shield) ability which provides a constant +50 Armor Rating and 25% reduced vulnerability to being staggered. Doubles while the PC imbibes in alcohol. Berserker Rage: constant +5% dealt attack damage, +5% physical damage resistance, doubling when below 50% Health. +25% chance to stagger opponents. TES Lore: added +7.5% Magic Resist and +7.5% Smithing Power. The above Orsimer abilities double when possessing Volendrung. If using R-IDB: Alik'r now all wear light armor that is imbued with blessings of Leki, Onsi, Tu'whacca, or Ruptga. These blessings only effect Redguard PCs and NPCs. Sword Singer: Wielding one or more scimitars doubles the Adrenaline Rush weapon speed benefit. Command Animal daily power replaced by Bosmer Marksmanship: constant +7.5% Marksman damage. Doubles when in possession of Auri-El's Bow and/or Shield. The Greenpact Feast provides +5% attack damage and damage immunity. +10% movement speed, doubling while imbibing in the Greenpact Feast. Load Requiem - Immersive Abilities.esp after Requiem.esp and before Requiem for the Indifferent.esp. Load R-IA before "Requiem - IA Racial Body Morphs patch". Thanks to t0miki for in depth bug testing to make fixing the vanilla Skyrim movement speed bug much simpler.